Solar Power In A Can! When spending time camping, people often bring lanterns, flashlights, and the like — you might even bring along a solar charger. 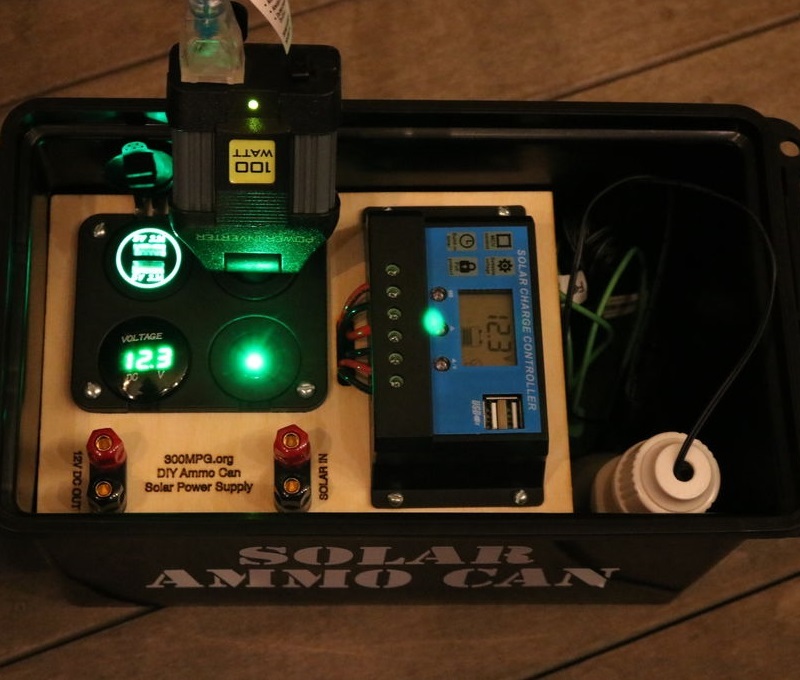 Instructables user [bennelson] is combining all your electrical powered needs by cramming solar power into a can. Already designed to resist the elements, [bennelson] is using a 50cal. ammo can for a portable enclosure. Inside, he’s siliconed a 15AH, 12V lead-acid battery in the centre to maintain balance and to leave room for the wiring and storage. One cardboard mockup later, he laser-cut the top panel from 1/8″ plywood and secured a 20A solar charge controller, a four-in-one socket panel, and two banana plugs on its top face. [bennelson] is using 12 AWG wire to match the 20A rating of the solar charge controller — including a fuse for safety — and lever lock-nut connectors to resolve some wiring complications. Industrial velcro keeps the top panel in place and easily removed should the need arise. When he’s out camping, he uses an 18V, 1A solar panel to charge, but can still use a DC power adapter to charge from the grid. Check out the full build video after the break! Launched over 10 years ago, the Squeezebox was one of the most popular network streaming devices sold. The idea was simple: put some MP3s on a computer, connect the Squeezebox to a LAN, and stream those tunes. Someone at Logitech had the brilliant idea that MP3s and other audio files should be stored in an online service a while back, something that didn’t sit well with [Richard]. He went out and built his own Squeezebox with a Raspberry Pi, out of an ammo box, no less. Most of the project is based on another Squeezebox Raspi mashup over at Instructables. This was a wall-mounted project, and not encased that keeps 7.62 ammunition secure during transport. It did, however, provide enough information for [Richard] to use in his project. To make his Squeezebox look a little more industrial and sturdy, he cut a few holes in a NATO ammo can for speakers, a TFT touchscreen display, and a USB charger port. Inside, a pair of powered speakers, a USB hub, and a powerbank were added, making this a portable streaming solution that can take a beating. Calling this a boom box is at least slightly ironic. Instead of high explosives it now carries high decibels in its new life as a self-contained sound system. Despite the conspicuous power cord a peek inside reveals a big enough battery to keep the tunes playing for hours on end. [King Rootintootin] kept the cost on the build down since he was given the used speakers and amp by his girlfriend’s dad. The amp kicks out about 25 Watts with the battery rated at 7.2 Ah. He added a charger and routed the controls to the side of the ammo box so that it can be charged without removal. The only external component is the audio jack which connects it to the music source. One of the suggested improvements from the Reddit thread is to add baffles inside of the enclosure so that sound from the two stereo channels doesn’t interfere with each other. Sometimes you need a power supply that can be thrown into the back of a car and taken into the field. [BadWolf] didn’t want to take his bench supply, so he whipped up this very portable power supply made from a computer PSU. To ruggedize his build a little, he put it in a 50 caliber ammo can making it more than able to handle the roughest field work. While not a proper adjustable power supply, this ammo can is more than capable of delivering a whole lot of current in a number of different voltages. There are a few bells and whistles – a ‘plugged in’ and ‘on’ light, as well as a few very cool looking toggle switches that are sure to arouse the suspicions of unsuspecting bystanders. 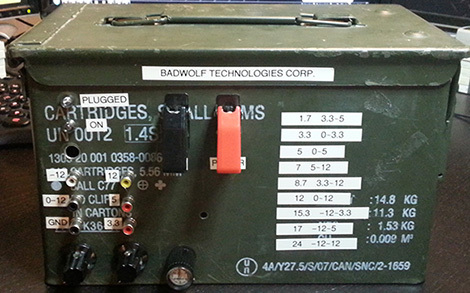 [BadWolf] kept all the safety features built-in to the computer PSU, so this ammo box power supply is still protected from short circuits, and over-current, making it much safer than its appearance belies. It’s also a great example of what can be done if you don’t have a proper bench supply, so we’ve got to tip our hat to [BadWolf] for that.